Highly abrasive resistant cables feature high copper stranding for maximum flexibility and longevity. Silicone rubber construction offers unmatched properties in terms of resistance to chemicals, UV, cold, etc. 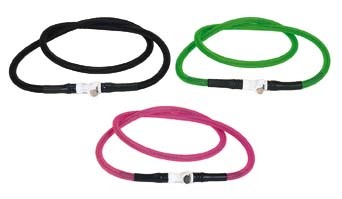 Cables are available from 12" and up, in three different colors: standard black, optional neon green and neon pink.